SKU: 23459. Category: Courses. Tags: data science course in bnagalore, data science training in bangalore, data science with R programming training, learn data science online. 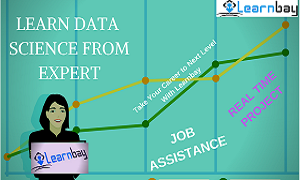 Learnbay Provides data science training in Bangalore from certified experts.Our course helps you to learn various data analytics techniques using R and Python programming.Data Science Course content is designed by experts to match with the real world requirements for both beginner and advance level.Many real world problems and case studies are implemented throughout the course and discussed in the class with tons of assignments for practice.If you are looking for data science training in Bangalore, Enroll for the Free Demo Session. This course will benefit you to master data science skills and will help you to to handle interview with more confidence if you are looking for job in data science domain. Those who want to become master in data science and Data Analytics in R Programming. Data Analysts who wants to improve their skills. Developers aspiring to become data scientist. There is no prerequisite for this course.If you are new to data science, this course is best for you.Basic Understanding of statistics/Linear Algebra/Probability and R/Python will help. Live Classroom data science training in Bangalore by industry experts Classes with 40% theory and 60% hands on Trainers having more than 10+ years of experience in multiple domains like finance,Healthcare ,Retails.Practical Approach With Mini Projects And Case studies. Job Assistance And Placement Support After end of Course. What is data Science? – Introduction. Importance of Data Science.Demand for Data Science Professional. Brief Introduction to Big data and Data Analytics. Use R for simple maths, creating data objects from the keyword. How to make different type of data objects. Understand the various data types that the language supports. Data Frames- create and filter data frames,Building And Merging data frames. Importing and exporting Data into R- importing from files like excel, csv and minitab. Summary Statistics for Matrix Objects. apply() Command. Bar Chart,Pie Chart,Histograms- Create and edit. Visualisation in R using ggplot2. Covers an overview of using relational databases. Full Join, Union and MANY MORE…..
Getting input from User,Comments,Multi line Comments. Pandas Data Frames,Indexing Data Frames ,Basic Operations With Data frame,Renaming Columns,Subletting and filtering a data frame. Probability distributed function and cumulative distributed function. Measure of central tendency and measure of dispersion. Computing Standard deviation and Variance. Introduction to Logistic Regression.– Why Logistic Regression . Application of logistic regression to multi-class classification. Advantages And Disadvantages of Logistic Regression. Case Study:To classify an email as spam or not spam using logistic Regression. How to build decision tree? How to Find final size of Trees? k-Means algorithm for clustering – groupings of unlabelled data points. Introduction to natural Language Processing(NLP). Understanding and Visualising a CNN. Certificates On successful Completion of Project And Assessment. Why Should you choose a career in Data Analytics in this era? It enables you make more better and right decision. It helps you to solve complex problems in easy way. It is easy to measure the effects and after effects using data science. It is more action oriented than theory. It promises you best career ahead. Can you become a data scientist ? Answer is Yes, you can. Whether you are from commerce background or from science college, you can become an specialist in data analytics. Professionals such as business analyst want to get growth in career. Any developer or programmer in software, regardless of the programming language they have command in. Freshers- just out of college or working professional. What do you need to become an expert in data science ? Are you passionate about growth in your career? Do you love studying numbers ? Do you enjoy solving problems ? Then sure you can learn and become an expert in data analytics/science. How long does it take to become certified in data science ? Around 130 Hrs, ie about 4 and a half month with classroom training. 1. What are the profiles of Trainers? Our Trainers have relevant industry experience and are working in MNC as data scientist. 2.How many Case studies and Projects are covered in the course? Course has multiple case studies and mini Project.Our course is designed by industry experts. Course features many real time problems.Please refer course content for more details. 3. Do i Need to carry my own laptop?What the the softwares required? Yes,You need to carry your own laptop.To start with ,You need to install R And R studio installed in your system. Both Of these are open source and in first class,trainer will help you to setup the environment in your system. 4. Can i Attend a Demo Session before enrolling for the course? Of course,You can attend a Free live Demo Session before enrolling for the Course. 5. Are the session Online or Classroom? 6. Will i Get Class Recording if i Enroll for Classroom Session? Our live Classroom Sessions are recorded and after the session ,Class recording will be shared to you. I would like to recommend any one who wants to be a Data Scientist.Explanations are clean, clear, easy to understand. Their support team works very well such any time you have an issue they reply and help you solving the issue.Good trainer for Machine Learning and R.
I opted for data Science classroom Program.Trainers are good and have industry experience in data science domain.Content is well organized and real time case studies are covered.Got very good response from support team .Thanks Abhisek for your support. I liked the data science course by learnbay. They provide both Python And R Programming .Also Course has SQL,Introduction to Apache Spark And Tableau.Many Case studies and Project helps a lot. I would suggest working professional who wants to start their career in data science domain can enroll for the course. Good mixture of theoretical and practical training.Course helped me in all areas and understanding the vital concepts of machine learning and statistics.Very Flexible timing. Whole experience was great.Instructor carries good knowledge in subject and has rich experience in data science domain. Very Good Institute to start your career in Data Science field. “Highly recommended”. Have completed the training on data science from “Learnbay” and can say only one word that those who wants to learn they should join the “LEARNBAY”. Trainers are industry experts and provide detailed explanation on every topic with real time examples and case studies by Utkarsh Sir. Utkarsh is really good faculty member in learn bay because he face actual problems in machine learning at company level. he realize ,what happen in Data Sciences and very knowledgeable person in Data sciences truly i realize. Joined Learn Bay for Data Science using Python and R.
Very good institute with supportive Instructors. They make an effort to clear your doubts and questions. Staff members are also very supportive. Provides online/youtube recorded sessions which is helpfull to go thorugh again and again for some clarification. You can attend sessions from home as well, if you cannot make it to classroom. Would like to recommend any one who wants to switch to data science domain and looking for a classroom training in Bangalore.Course content and trainers are top notches.I like the way of teaching of Python And Machine Learning trainer.Number of case studies from every machine learning Algorithms and real time business problems and examples helped me to understand the concept easily.Course is very organised from starting till the end. Trainers are explaining the real life scenario using modeling and statistics techniques. Enrolled for data science course at learnbay in July 2018.Learnbay helped me to learn data science with real time project which helped me to land a job in data science domain in reputed MNC.The best thing I liked about them is option to attend multiple batches and projects so that you can revise important topics in other batches also. I took course on data science with learnbay .Course was well organised and content is excellent .Instructor is very knowledgeable and good. Real time projects and case studies helps a lot in interviews.Would suggest to add few projects on deep learning and computer vision. Course is actually quite good. I learned a lot and some of the instructors are exceptionally well and if you really pay attention, it can boost your career by great extent.Course content is very well structured and detailed.I Would recommend Learnbay to IT professionals who are looking to change their domain to data science. Thanks Learnbay for great learning experience. I took Data Science Course from Learnbay .The training program is really nice. Course content is good .Instructor is experienced and having patience to clear all the doubts in class itself. Projects are good.Best thing about course is you can attend multiple classroom batch and finish the course at your pace.Also ,You have option to attend the training online from home if you are not able to travel to classroom.Instructor utkarsh is really good and he will teach complex machine learning algorithm in very simple way. I have completed Data Science Training from Learnbay. This is job oriented course with updated course modules as per the industry requirement.Course is more practical with project .I would definitely recommend to working professionals who is serious about learning and changing his current domain to data science. Learnbay helped me to learn data science and helped to build my portfolio with real-time projects.I got a job in reputed IT company as data analyst.Course is suitable for working professionals. Learnbay is a great platform to study Data Science Course. Both online as well as Class room training sessions had awesome learning atmosphere. The Content of the course is well designed according to the industry needs. Even the project sessions helped me a lot to gain experience and understand the concepts. I have joined data science course at Learnbay in the month of Jan. The way the course modules are structured is great. They have very well thought about the changes in the industry and designed the course accordingly. The trainers here are also great for the way they train. I have taken up classes from Mr. Pankaj, Mr. Amritansh and Mr. Utkarsh and the way they train is what i really like about.